Bridal Veil Falls is best viewed from Water Wheel Park, a short and easy walk from the downtown of Idaho Springs, Colorado. The legacy of steam locomotives and gold mining make this a historic hike in an historic Colorado town. Explore the full Bridal Veil Falls hike profile below for trail map, driving directions, and many of the details you need to enjoy this waterfall in Idaho Springs, Colorado. The parking area for this short hike/walk is in downtown Idaho Springs, at the corner of 17th and Water Street, which is situated behind the downtown restaurants and shops. Use the driving directions above, which lead to Harold Anderson Park. At this small park, just across from the parking lot, you’ll pick up a concrete path that leads under interstate 70 to Water Wheel park (scheduled to open early June of 2016). 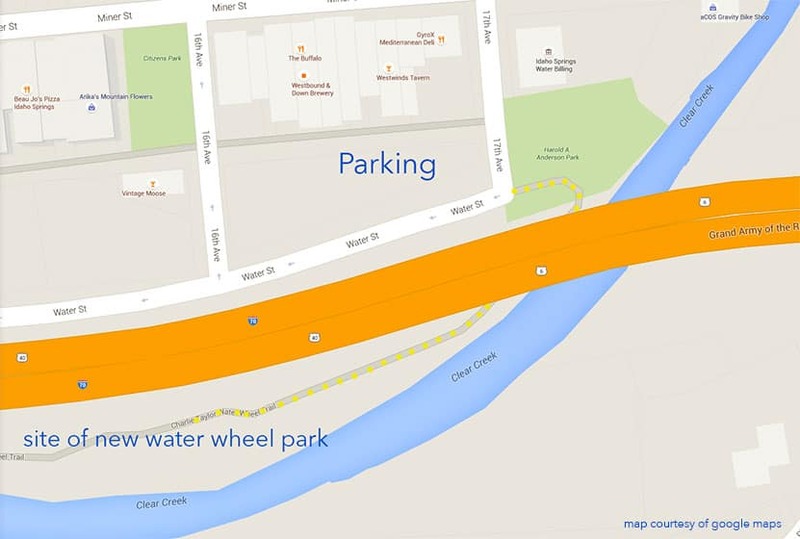 See the marked map below for a visual of the parking area, trail (yellow dots), and the location of Water Wheel Park. It’s a little hike (more of a stroll) with a lot of history. Starting at Harold Anderson Park, you’ll want to take a gander at Locomotive #60, one of five remaining steam engines that ran on the narrow gauge rails of the Colorado and Southern Railway. Kids will love the train and the other sites along this short jaunt. The Charlie Taylor Waterwheel Trail leads under Interstate 70 then goes west for about 1/10th of a mile before it arrives at the best viewing area for Bridal Veil Falls. 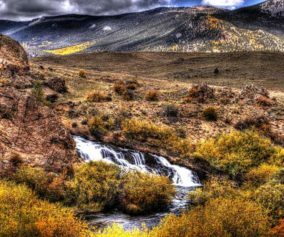 The waterfall spills out of Soda Creek high above, making its way then into Clear Creek, a stream famous for its gold, river rafting, and Coors Beer. 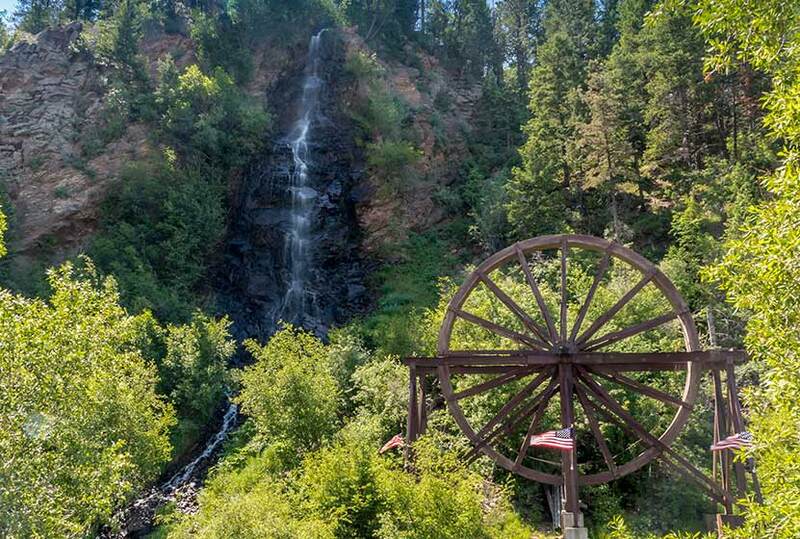 The water wheel that’s just north of Bridal Veil Falls was built in the late 1800’s by a local miner, Charlie Taylor. Taylor used the water wheel to drive a machine called a stamp mill–imagine a big hammer that grinds and crushes rock to get silver and gold ore out of it. It was relocated from Ute Creek to its present location by a group of volunteers in the 1980’s and now belongs to the Idaho Springs Historical Society. The Colorado Department of Transportation is renovating Water Wheel Park during the Spring of 2016 with a goal to have the project completed and reopen the park in early June. There are several Bridal Veil falls in Colorado. 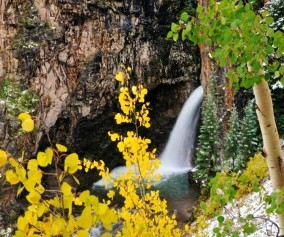 For Bridal Veil Falls at Hanging Lake, view our Guide to Hiking Hanging Lake page. 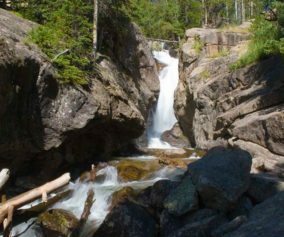 Or Explore our trail profile for Bridal Veil Falls in Rocky Mountain National Park. If you are vacationing in the area and looking for more places to explore with your family, we recommend checking out Echo Lake, the Mt. Evans Summit Hike, or the Mt. Bierstadt Trail on Guanella Pass. See our day trip recommendation in the tips section below. Plan a Day Trip: Make this a family day trip by arriving early at Echo Lake to see the reflection of Mt. Evans in its mirror waters, then drive up to the Summit of Mount Evans. After your drive back down, take in the sites of Bridal Veil Falls at Water Wheel Park, then grab lunch at Beaujo’s Pizza in downtown Idaho Springs. Add a Railroad Hike Tour: The Georgetown Loop Railroad still operates on what remains of track of the old C&S Railroad. 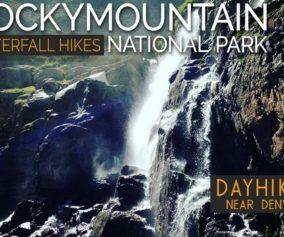 Located just a few minutes drive from Idaho Springs, they offer a hike + railroad tour, a great family adventure near Denver. Explore more at our Georgetown Railroad Hike page. Photo: We would like to express our gratitude to John Weitzel for sharing such an amazing photograph of Bridal Veil Falls in Idaho Springs, Colorado.